Outside of Hilton Hotels who have rolling changes throughout the year, most major hotel chains release reward night changes in the first few months of each year. IHG is the first major hotel chain to release their hotel reward night updates for 2017. 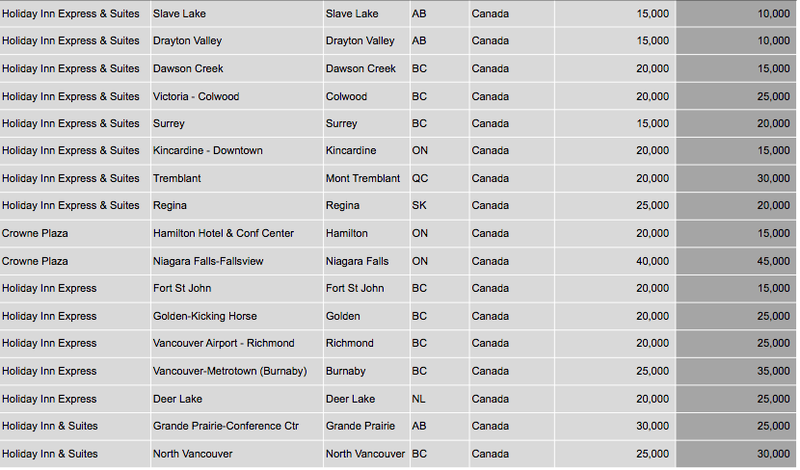 This list of over 650 hotels came out last week and it includes 31 of their Canadian properties. One must know that there aren't actually changes to the point redemption levels for each category rather this list contains hotels that are moving up or down in those said reward categories. Roughly 75% of the 650+ hotels worldwide are moving to more expensive award night categories. Here in Canada 20 of the 31 or about 65% are becoming more expensive to redeem for. These changes take place on January 15th so as we always advise with hotel category changes, if you have had your eye on a redemption at a hotel that will be going up in price try to redeem before January 15th and likewise if the price is going try to hold off to redeem until after that date so that you can save some points. Now we just have to wait for the annual Marriott, Hyatt, and Starwood category changes! Here are the 31 hotels in Canada that are changing on January 15th and you can find the complete list of hotels that are changing worldwide here.